Most people know what a “bucket list” is, for those that don’t … it is a list of things you want to do before you die. You can also find the movie, “The Bucket List” with Jack Nicholson and Morgan Freeman and give it a watch. This will give you the basics. When I was putting my list together, I was worried that I would fall victim to that old “procrastination” monster. You know the one that keeps you thinking about goals but not actually taking any action on them. I really had to work it out in my head and create a mindset of small steps. I think ultimately fear is what gives birth to that procrastination monster, and is also the big “thing” that gets in the way of us really stepping out there and trying new things. We start to worry and then get stuck in the analyzing mode. How much will it cost? How long will it take? Will I die trying this? What will others think of me? I know it is extremely hard sometimes to get past those feelings of fear, but you CAN do it. It starts with shifting your mindset and then building up courage. The fear doesn’t actually go away. You just make the decision that your goal/result/task/ desire is much stronger than the fear. There are a few steps that you need to walk yourself through that will get you heading in the right direction. I would highly recommend keeping a journal to help you dig into your mind. Ask yourself, “Where are my fears coming from? Past history in our lives, or maybe all the people around us saying we can’t do this or that. You need to discover just where the root of these fears lies. Accept fear as the price of success. Trust that everyone has fears and many people can never break free of it, but there are those that do keep moving forward. Light a fire. Light a fire of passion inside of you that burns away the darkness of fear. Take control of the things you can and have faith that everything else will work out as it should. The items on the list can be anything and everything under the sun! I have my list broken out into categories: travel, fitness and new skills are just a few. Here is what I have for new skills. After you’ve made the list, the only thing to do is Go For It! 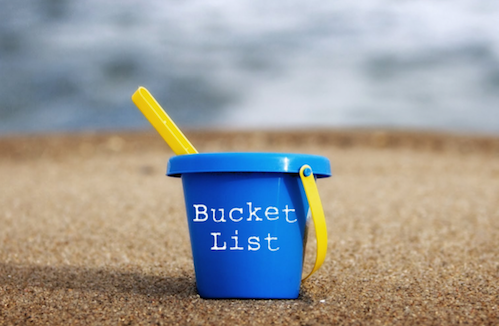 Each week or month, strive to carry out an item on your Bucket List. Then, cross it off your list. You can add to your list as you think of other activities you’d like to do before you’re no longer on this earth. Life is for living and what better way to do it than following your dreams and really enjoying it by experiencing it. You’ll become infused with energy and excitement at the idea of achieving another activity on your bucket list. With your bucket list, you might be compelled to discover an existence you’ve only fantasized about. At Sacred Earth Partners, we believe that it is possible to have your cake and eat it too! We believe that you can create a Lifestyle AND a Business with your passions. We are dedicated to bringing programs, courses and products designed to support a holistic lifestyle and business that nourishes the body, mind and spirit. Inspired Balance aims to inspire women and encourage them to embrace her inner Sacred essence. Inspired Actions aims to inspire and empower Solopreneurs to create Micro Lifestyle Business. Take a quick trip of to PassionDivaGuides.com to sign up for all new magazines, coming your way monthly. Hurry go there now!